Today is the time of the month when all the My Pink Designer's get together for a collective post on My Pink Stamper. This month we are featuring the new My Pink Stamper Girlie Doodles IMAGE stamp set and the My Pink Stamper Girlie Sayings Sentiment Stamp Set. Please visit My Pink Stamper today and see all the fabulous creations the Design Team made with these sets. Stamp = My Pink Stamper Girlie Doodles (outside of card), My Pink Stamper Girlie Sayings (inside of the card. 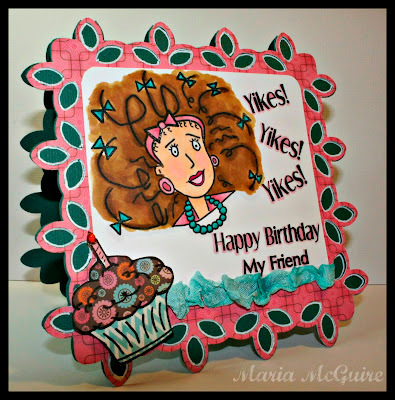 Cricut = Paper Trimings- 2 frames welded together for card base and frame. Oh wow!! That big hair lady looks fantastic and I love how you used so many sentiments!! !